Someone who has had a life long love affair with bold and bright colour and all things bling, black has been a distant love of mine. I have never doubted its slimming powers and timeless appeal, but when given a choice, I have mostly gone with colour over neutral shades. While black is not the ruling colour of my wardrobe, it is safe to say my wardrobe is not 100% devoid of black either. As much as I love colour, I think it is time for me to update my wardrobe with what I refer to as, ‘must-have blacks’. Not only is it a necessity but a much needed change in personal style as well. When I decided to pen down my black lust list, I came up with endless options. However, I finally managed to narrow it down to these 5 black beauties. Here's my lust list of 5 black things that I wish soon become mine! The hunt has begun. 1. Classic black BORDER SAREE: I have always considered the classic black border saree an Indian alternative to the LBD. They both have that same ageless, timeless appeal. From a 16 year old girl to a 70-year-old grandmother, from a business meeting to a wedding reception and from petite to curvy, the black border saree complements women of all ages and sizes. It is one of those rare pieces that can easily be passed down from one generation to the next. A black border saree is not only a stylish pick but a wise investment as well. 2. Quintessential am to pm TOTE: I am a major bag hoarder. You name it and I have a bag in that shape and colour in my collection. However, thanks to my colour obsession, I never really got around to investing in a black tote. Especially one that is ideal for any time of the day as well as multiple occasions. My idea of a quintessential A.M to P.M black tote is one that can be carried to a working brunch and dinner date and can be easily paired with Western and Indian wear. 3.The perfect jet black EYELINER: You think finding Mr.Right is hard? Try finding the perfect jet-black eyeliner (eye pencil/kajal) for oily skin. Now, that my dearies, is the real challenge! From pencil, liquid to gel, I have more than my share of black eyeliners, but I am yet to find that one eyeliner that does not smudge and run even on the most humid days and oiliest of oily skins. Throw in long lasting and I have literally found what I am looking for. Till the day I find my kind of perfect jet black eyeliner, I ain't going to stop looking! 4. All eyes on me STATEMENT SUNGLASSES: From Jackie Kennedy to John Lennon, ever one had their signature sunglass frames. Mine are cat eyes. While I have managed to find a pair of regular cat eye frames, what I am really look for is, one of its kind, all eyes on me, black cat eye statement sunglasses. 5. Dainty WATCH: Lost amidst the chunky metallic and big dial watch craze, I had forgotten how elegant a dainty black watch looks until recently I saw one of my fave actress flaunting her black watch. Since then, I have been looking for just the right black watch that is the perfect blend of style and class. Here's the thing-Along with these 5 being on the top of my lust list, these 5 pieces are fashion must-haves as well. Ladies, time to invest in these 5 black beauties. What do you think of my black lust list? Share your views with me in the comment section. 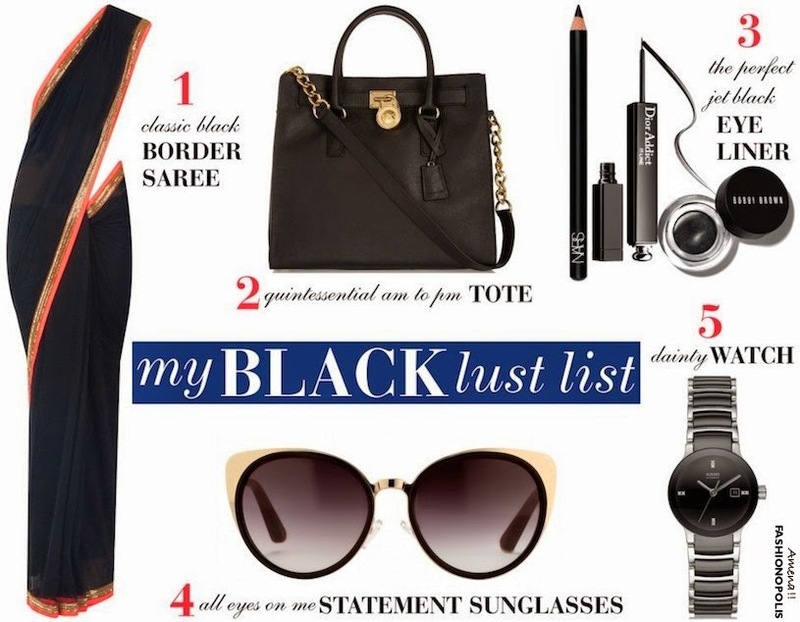 Awesome list..my vote goes to the black saree. Black is the safest colour and I can always count on black. The must have list is bang on! I always like bold & bright color & black is one of my favorite color.